A big welcome to Diane from Home Sweet Homemade. Diane’s blog header inspired my button flower bouquet – and she’s my guest blogger today! Take it away, Diane. Thank you Michael! I’m so happy to be here at the Blue Velvet Chair! I first spied Michael’s blog at a linky-party where she had posted one of her delightful mosaic projects. And I became an instant fan. Her creativity and friendliness virtually sparkles through her blog and the fact that she’s living in Sweden is so intriguing to me. (Scandinavia is, after all, the home of Hamlet.) I’m completely thrilled to be Michael’s guest today and even more thrilled to host her over at my blog, home sweet homemade. Every once in a while, I see an image that just captures my imagination and I’ll find myself hunting around dozens of blogs for more. That’s how the “things I love” posts are born. Years ago, travel was part of my work life. On a 6-month project in Chicago, I was fortunate to rent a room from a local homeowner just north of the loop, rather than stay in a hotel. The guest room in her charming home had a non-working wood-burning stove against one wall. 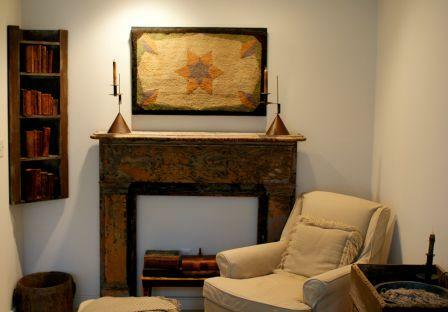 The homeowner had cleverly arranged some bricks on the floor to resemble a hearth and a shelf above for a mantel. 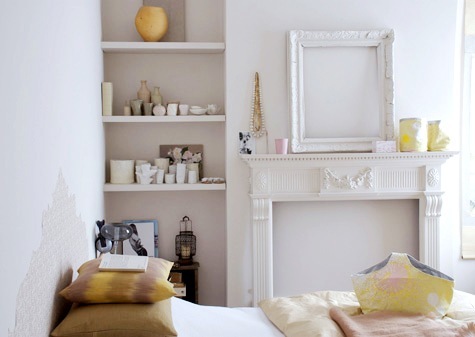 The look was totally faux, but the room’s warmth completely genuine. My design lesson from that experience was that it is indeed possible to enjoy the psychological benefits of a fireplace without actually having one in a room. Let’s look at a few examples, shall we? Regardless of the season, everyone loves a fireplace — chimney not necessarily required. Faaaaaabulous blog exchange post, girl! I adore the look of a mantel fireplace. They give such a warm and coazy feel to a room; without having to actually light a fire. All of these mantel's you featured are stunning! Congrats to all! And thank you Michael. for having my dear friend here on your lovely blog (which BTW I love your blog design). Simple and clean! Great post! I love fireplaces, and would like to have the real thing someday. But for now, I'll be happy with what I have! This was a fun surprise! 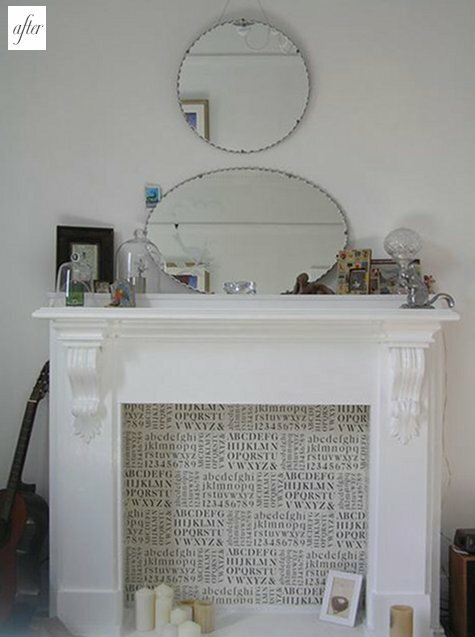 Thanks for featuring my mantle! A huge thanks to Diane for agreeing to guest blog here at BVC. Love her creative spirit. If you haven't checked out her blog…hop over and have a look around. If you like mine, you'll like her aesthetics as well.